Shoved into a corner, gathering dust and being buried by old shipping envelopes, the school house piano has seen better times. I’m assuming this instrument has had many years use in the belated classrooms of this school and once was accompanied by the voices of young students. 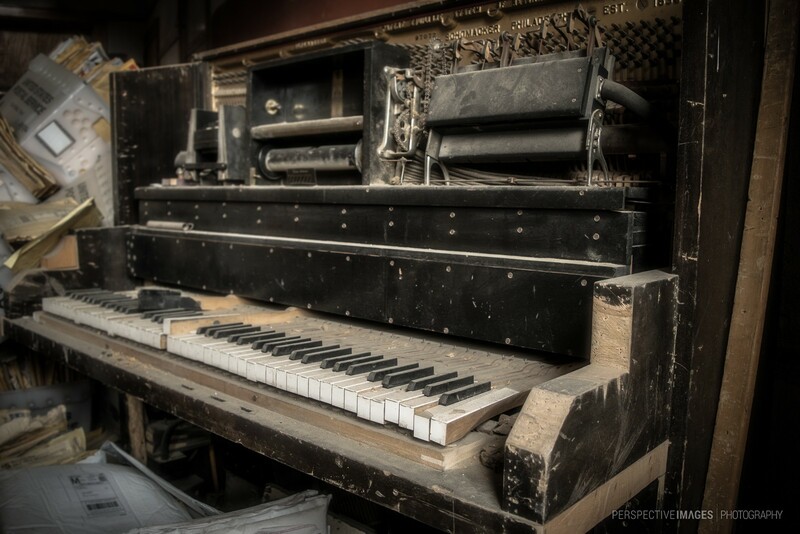 Gorgeous photo…this schoolhouse piano is amazing! very nice images! i like it! Unfortunately, my first school did not have a piano. But, even without instruments, my teacher (Eugenia was her name) taught us many songs. I think that everyday, we sing a little bit. An now, the big question: do you know to play piano? That’s a pianola from the look of it. Odd instrument for a school to have. It was a small school so I’m guessing they had it incase none of the teachers knew how to play. A player piano by the looks of it, Will. WOW. It could tell a thousand stories, I’m sure! I smell the dust and can the hear the off-tune sound. great picture! Excellent. The beauty you find in decay is amazing. Poor piano is looking quite sad. But this is not a usual piano. Seems to have an automatic like this one. It indeed has seen better times 🙂 Nice picture! Magnifique ambiance. Magnifique détails avec ce piano.